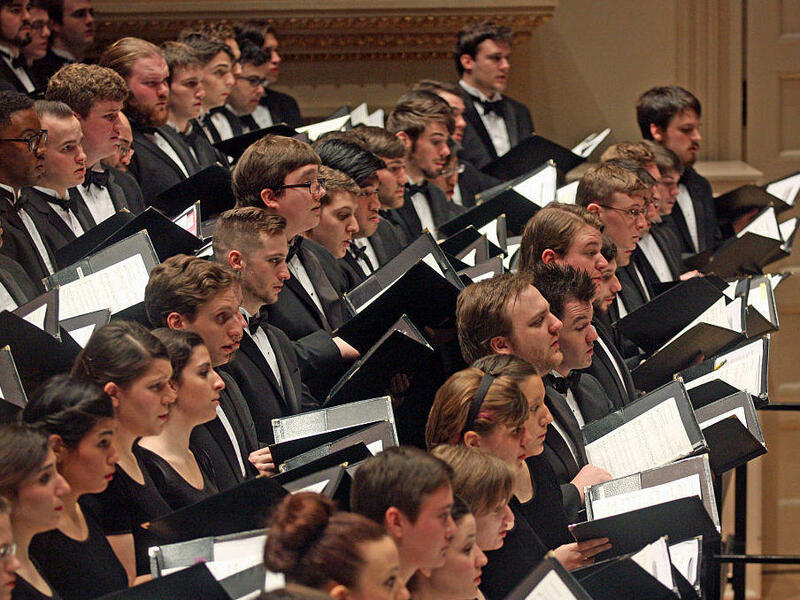 Students of the Westminster Choir College perform with the Vienna Philharmonic at New York's Carnegie Hall in 2015. A small, highly specialized American music college in Princeton, N.J., is up for sale — and its prospective buyer is a Chinese for-profit company that is partly owned by the Chinese government. The planned sale is raising red flags on and off campus, triggering speculation about the prospect of an authoritarian, foreign government running an American institution of higher learning on U.S. soil and creating chasms between the groups most invested in Westminster Choir College's ongoing health and success. Westminster is a very select music conservatory, with room for some 400 students. Founded in the 1920s, it specializes in training singers as well as music teachers, pianists, conductors and other music professionals. The school boasts of regular performances with the Philadelphia Orchestra and the New York Philharmonic, and its students have sung with the likes of Leonard Bernstein and Arturo Toscanini. Over time, however, Westminster struggled to balance its books as an independent school; conservatories are notoriously resource-intensive operations, especially considering the one-on-one and small-group training that classical music demands. In the early 1990s, Westminster became part of nearby private Rider University, located about 8 miles away in Lawrenceville, N.J. The merger worked well for nearly 30 years. Rider University's current president, Greg Dell'Omo, took up his post in 2015. Within about a year and a half of his arrival, Rider announced that it was seeking a buyer for Westminster. Dell'Omo says his board and administration reached out to hundreds of conservatories, colleges and universities in the U.S. and abroad, to see if they would be interested in buying Westminster. "Unfortunately," Dell'Omo says, "there was not one U.S. university that was willing to put a proposal together to meet all of our guiding principles, primarily being willing to operate in Princeton as Westminster Choir College." But then, in the fall of 2017, a Chinese company called Kaiwen Education put together an offer for $56 million: $40 million for the purchase, Dell'Omo says, and an additional $16 million investment in the school's infrastructure and programs. Soon after, the potential sale became the subject of a pair of lawsuits. A group of Westminster alumni and donors filed a suit to stop the sale. Another lawsuit was filed by Princeton Theological Seminary (PTS) in February; it argued that Rider's plans to sell Westminster did not comply with the wishes of the donor of the land that Westminster's campus occupies in Princeton. The 1932 donation, PTS says, specifies that if Westminster ever ceased to provide training to future ministers of music for evangelical churches, the property was to revert to the seminary. Dell'Omo argues that China is a natural market for Westminster's offerings. "When you look at Asia, primarily in China, Singapore and South Korea — the attendance of conservatories is just off the charts," Dell'Omo says. "And that's where the growth is going to be." Dell'Omo is not wrong: Western classical music is indeed a very big business in China. New concert halls and opera houses with thousands of seats have opened in cities like Beijing and Guangzhou. Across China, owning a piano is a clear marker of upward mobility for striving families. According to Chinese government figures, 80 percent of the world's pianos are now made in China. American classical music ensembles and institutions have rushed to stake claims there, too: The famed Juilliard School, for example, is currently opening a branch of its campus in the city of Tianjin. Dell'Omo contends that in brand-conscious China, Westminster is a particularly premium label. Not only has the school sent students and alumni to stages from Carnegie Hall to American Idol, but its alumni include Yannick Nézet-Séguin, the current music director of both the Metropolitan Opera and the Philadelphia Orchestra. "They clearly understood the value of Westminster the brand," says Dell'Omo. Kaiwen is an unusual entity to buy an American institute of higher learning. The Chinese company has no experience running a college, or a music school — facts that Dell'Omo admits. He contends that these factors will eventually prove to be a boon for Westminster's current faculty members, saying that Kaiwen will need them to stick around. "They know that they don't have the experience," Dell'Omo says. Education was not even the company's main business. It was called Jiangsu Zhongtai Bridge Steel Structure and manufactured steelwork for bridges, ships, cranes and power plants. But it got into education in 2016, opening the Beijing Kaiwen Academy. The company renamed itself and began trading as Kaiwen in December 2017 and currently runs two private, grades K-12 schools in Beijing. As it turns out, Kaiwen isn't an independent company. It's partly owned by Beijing's municipal government — the Haidian District government, says Bruce Afran, the lawyer representing the alumni and donors who have filed suit. Afran says that Kaiwen's ownership came to light as he and the plaintiffs he represents prepared their case. Afran explains, "We simply went into the Kaiwen Education website and we looked at their various shareholders. Among their shareholders is Badachu Holdings Group. So we then go to Badachu Holdings Group, and we see that the school called Kaiwen Academy, that Kaiwen Education says it runs, is actually a wholly owned subsidiary of Badachu Holdings Group. Then when we go to the webpage of Badachu, it says that it's a wholly state-owned company, owned by the government of China." After Kaiwen's ownership became known, Rider University declined requests for a follow-up interview with the president, Dell'Omo; the corporate leadership of Kaiwen did not respond to NPR's requests for interview or comment, made over several months. Afran argues that at this point, preventing the sale is a matter of protecting the independence of a U.S. institution. "This is the first time that any functioning, intact American college is being sold to a foreign government, particularly an authoritarian government," Afran says. "We're going to see that their academic freedom will now be subject to control by government bureaucrats in Beijing." The other Westminster professor mentioned in the suit filed by alumni and donors is Carolann Page, who originated the role of Pat Nixon in John Adams' Nixon in China. The 1987 opera — with its biting portrayals of Mao Zedong and his wife along with Richard and Pat Nixon — has never been known to have been performed in China, despite many other performances around the globe. "It is difficult to see," the suit argues, "how she (or any other Westminster faculty member) could reprise such a role once Westminster is taken over by a unit of the Chinese government." Before Kaiwen's ownership became commonly known, members of the school's faculty as well as current students and alumni were airing other concerns. "Kaiwen has no higher ed experience; it has no experience in the highly specialized world of professional music," says Joel Philips, a professor of composition and theory at Westminster. "The only education experience it has is running these for-profit, K-12 schools during the past two years. And for us, profit is the key word — because profit is what's motivating both president Dell'Omo and his proposed buyer." For its K-12 schools, Kaiwen has already created partnerships with two big-name sports brands: Major League Baseball and Manchester City Football Club, which offer coaching and training to Kaiwen students in Beijing. Philips wonders why Rider couldn't have created a profitable partnership with Kaiwen, perhaps structured similarly to the MLB and soccer deals. "Kaiwen didn't buy Manchester City," Philips argues. "They just struck a deal to cooperate with them. We would be very happy and excited to do a cooperation, but as a partner — not as something owned by a for-profit business." Moreover, Philips says, "it seems strange that someone would want to outlay this much money when they could come to us and say, 'We want to franchise your name,' and then do the deal for $500,000 or $1 million per year. It would seem to be a much more cost-effective way of going about this. But they seem to be very interested in the 08540 ZIP code. It's easy to understand why someone would be interested in an educational property five blocks from Princeton University." Shanghai-based educational consultant and author Lenora Chu has spent years studying the Chinese educational system. She says that there has been a boom in private schools with foreign ties that appeal to China's fast-growing upper and middle classes. And, she says, there's a hunger within China to monetize the students who are heading to the U.S. for their educations. "For years," Chu explains, "American universities have been taking full-tuition-paying Chinese kids. First it was graduate students, then undergraduate became very popular. And now the Chinese want to go to American high schools. You look at this pipeline of Chinese going abroad and you say, 'Hey, maybe I want a little piece of that profit.' $56 million to acquire Westminster, it's really not that much money. It's a drop in the bucket — and they get a piece of this pipeline." Chu adds that for-profit education in China has boomed. "The government has allowed private education to flourish in China," she says. "And that's in part because the system needs to expand. The government doesn't have enough resources; they have 200, 250 million students to serve. It needs the help of the private sector." "There's a catchphrase in government circles here in China about trying to fix education," Chu continues. "They call it 'quality education,' saying, 'We need to move in a quality direction.' Suzhi jiaoyu, that's the Chinese term — 'quality education.' And Kaiwen has basically latched on to that bandwagon and said, 'We're going to deliver quality education.' And they're doing it through sport and arts — it's about cultivating whole students rather than just a kid who crams for tests." Chu says that the partnership deals that Kaiwen is setting up seems to be part of that positioning and that the halo effect of being located in an Ivy League town increases the school's prestige even more. "And so you partner with MLB; you buy a music college," she says. "That's part of their philosophy. If instead of investing time and money into developing a brand, and instead you can pick it up for $56 million, and it's a legacy that's been around for almost a hundred years and it's got a Princeton, N.J., address — I think that's a pretty good deal, from their perspective." There are people within the Westminster community who do support the sale to Kaiwen; one is Ingrid Clarfield, a piano professor. Clarfield has been teaching at the conservatory since 1982 and is eager to see the kinds of exchange programs Kaiwen might put into place. Moreover, Clarfield contends, there are cultural priorities that make the Chinese company a particularly welcome owner. "Along with teaching at Westminster," Clarfield says, "I maintain a private studio in my home of gifted students. For over 30 years, over 90 percent of them have been Chinese. So I have a strong history and tradition with Chinese education, and their high respect for music education, and of the teacher being revered. So when I found out that we were being bought by a Chinese company, I was thrilled." The corporate leadership of Kaiwen Educational did not respond to requests for interview or comment made over several months. Instead, Rider University referred NPR to Larry Livingston, an experienced music school administrator who is chair of the conducting department at the University of Southern California's Thornton School of Music. Currently, he also holds an unwieldy, second title: He is interim president of a recently formed entity called the Westminster Choir College Acquisition Corp.
Livingston says that his first job is to help stabilize the school's enrollment numbers, which have been plummeting since Rider started soliciting bids — though he blames "social media" for the decline. However, he does acknowledge that rebuilding the student population will take time. "There's no silver bullet to this," Livingston says. "It's a matter of getting the word out that Westminster is alive and well, and moving forward. I think the primary objective is to create the legitimate and true impression in the public consciousness that Westminster is not closing. It's moving ahead, and its mission continues to be unique and powerful." Livingston acknowledges that the Beijing municipal government is indeed a part owner of Kaiwen — about 16 percent, he says. That number is being contested: In an analysis of Kaiwen, a senior member of the Rider business faculty says that Badachu Holdings Group owns 32.6 percent of Kaiwen, according to Kaiwen's 2018 third-quarter report — and makes the state-owned Badachu Kaiwen's largest shareholder by far. Even so, Livingston waves off worries about possible interference from the Chinese government. "The future operation of the independent, nonprofit Westminster Choir College will continue to be subject to U.S. laws and regulation as it is today," he says. "They can just keep pouring money into it"
But first, Westminster and Kaiwen have to get through those lawsuits. One of the plaintiffs in the suit filed by alumni and donors is Constance Fee, a professor at Roberts Wesleyan College in Rochester, N.Y.
Fee's own family history with Westminster stretches back 70 years. The daughter of a Westminster graduate, she is a Westminster grad herself and has served on the school's alumni council for over a decade. She says that once upon a time, Rider saved Westminster. "We are grateful to Rider University for stepping in 30 years ago," she says. "Everything went so well. It was a wonderful merger, collaboration, whatever you want to call it, until Dell'Omo came in as president with this idea to sell this jewel." Now, Fee finds herself in a different role. She is the president of a nonprofit called the Westminster Foundation, a group that is not just actively opposing the sale to Kaiwen but is trying to raise the money to buy the college and restore its self-determination. "The best would be for Westminster to become independent again," Fee says. "The next best would be to stay with Rider, but with a different administration. Everything had gone so well before." Livingston rejects Fee's goals as unrealistic. The Kaiwen sale is the only way to save Westminster, he says: "There's no other plan which has demonstrated sufficient resources to sustain the enterprise." Fee worries that her foundation and fellow plaintiffs are facing an unbeatable opponent in court. "If they're funded now by the Chinese government," she says, "there's no end to the money. They can wait this [lawsuit] out. They can just keep pouring money into it." In the meantime, the two lawsuits are wending their way through the courts. NPR has obtained a letter that Livingston sent to faculty in late October. He states that the suits, and other "extensive activity by certain groups, both within and outside of the [Westminster] community," have already "interfered with, and threaten to create future delays" with the timetable for the handover, which had been planned for July 1, 2019. There are other obstacles Kaiwen will need to overcome if the sale is to proceed. NPR has learned that during a meeting with Westminster's Alumni Leadership Council on Oct. 27, the school's dean, Marshall Onofrio, told the group that another reason the sale's closing date is being postponed is "problems with licensure with the state" of N.J. While all of these matters get untangled, Kaiwen is already laying out significant money toward its Westminster goal, on top of the $56 million purchase price. Last month, about 40 Westminster students toured Beijing — on a trip paid for and overseen by the Chinese company. Along with giving several performances and hitting some tourist attractions, the group visited Kaiwen's two K-12 schools in the city. According to the lawsuit filed by Afran, Westminster's choral director, Joe Miller, was informed before the Beijing tour began that the group's repertoire needed to be approved in advance by the Chinese government — another development concerning academic freedom that has raised alarm among Kaiwen's critics. In certain circles, however, the tour was perceived as a preview of good things to come under Kaiwen. Rachel Woody, a 20-year-old Westminster junior majoring in music education, was one of the students on the trip. She observes that she and her peers have endured more than two years of uncertainty at the school — almost since the time she first arrived on campus. "This is something that we've all stressed over for a long time now," Woody says. "Basically, my entire time here at Westminster has been completely up in the air because of this whole situation." Woody says the tour didn't just allay fears; it solidified her enthusiasm for Kaiwen. "The Westminster students are so incredibly excited about the opportunities that could arise," she says. That's especially true, she says, after Kaiwen staff dangled the possibility of future jobs at them during the Beijing trip — undoubtedly welcome news to music students who face uncertain economic prospects after graduation day. "All of the staffing directors at Kaiwen were very adamant," Woody says, "that they want students from Westminster to come and student-teach there, as music education majors or after graduation." Woody adds that she and her peers felt pampered in Beijing. "The [Kaiwen] hosts were constantly saying, 'Hey, do you need anything, let's fix this meal for you, are you comfortable, let me give you this bottle of water,' " she says. "It was 'Let me help you in any way that I possibly can.' And that kind of support from them — to be there at every beck and call — it made us feel like celebrities." Woody notes that this kind of treatment was entirely different from what she has experienced as a Westminster student so far, especially given the cloud of uncertainty that has overshadowed her time at the school. "It kind of gave us a sense of what it will be like with Kaiwen because they are so, so invested in what we have to offer them," Woody says. "I think that's something that I haven't necessarily felt in the past couple of years." In the audio of this story, as in a previous Web version, we say that Kaiwen had not been in the education business until last December. In fact, the company opened Beijing Kaiwen Academy in 2016. [POST-BROADCAST CORRECTION: In the audio of this story, we say that Kaiwen had not been in the education business until last December. In fact, the company opened Beijing Kaiwen Academy in 2016.] Transcript provided by NPR, Copyright NPR.